Both of my children sort of look like me, which I can see – but oddly enough, I don’t think they look anything alike. My son is on the short side for his age, my daughter is on the tall side for her age. My son has dark brown pin straight hair. My daughter has amazing blonde curly hair. My son’s eyes are sort of hazel/light brown. My daughter has blue eyes. They have differences well beyond the physical aspects. In school, she prefers English, while he prefers math. She likes art. He likes music. She comes off as quiet. He does not. She’s organized. He is not. He is very black and white. She – well, she is a girl so – much less so. Sometimes they seem so different from each another that I question if they have the same parents! He stands up for her – even when he doesn’t realize he is doing so. I’ve witnessed the “don’t do say that to my sister” or “what about my sister?” when they’ve played with a group of kids in the neighborhood. He will share or give her the last cookie or last piece of bacon in order to keep the peace. “Let her have it,” he’ll say. He gives an approving look when he’s impressed with a picture she’s drawn. He’s even chipped in to help with the occasional math homework. He tries to teach her right from wrong. Just yesterday, my daughter wasn’t all that nice to a little girl and he told her so. And my first recollection of his big bro-ness was when my son was in 3rd grade – around 8 1/2 years old – and my daughter was in her last year of preschool and around 5 1/2 years old. She was taking some swimming lessons before starting “real” day camp that summer. 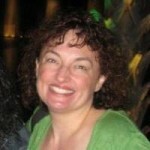 My son, my daughter and I went to the class – she was so excited beforehand. But when we got there, she would not go in the pool. I tried my best to remain calm. It didn’t work – and my son took over. He encouraged her try, told her not to be scared, and said that he’d stay at pool side to watch her. He took her hand, walked her towards the pool and tried to reassure her that everything would be fine. Then he says, “If you go in the pool, mom will buy you a donut!” I swear he almost had her! When that didn’t work, I knew she wasn’t going to head into the pool! As frustrating as the situation was, my son stepped up as the cooler head. The drama was well worth it because it was the first time I saw him in an “older brother” role. My son plays baseball in the spring. She’s hardly the cheerleader, but if his team loses, she calls the opposing teams cheaters for the whole rest of the season. My son is #8 on his baseball team. 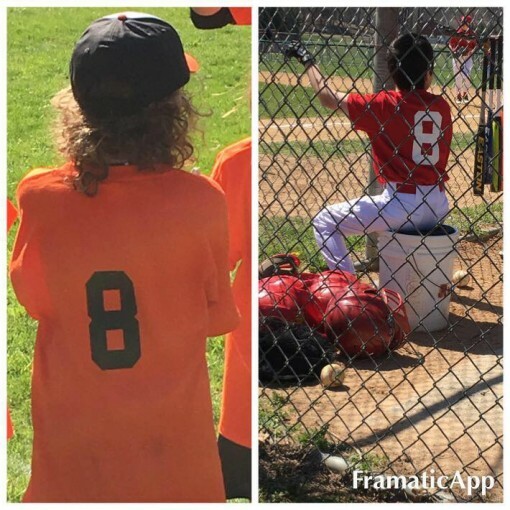 My daughter started playing softball this year and only wanted to be #8 just like her big brother. Good thing it was still available when I goofed and picked up #9 at first! When my daughter started Kindergarten, my son was in the 4th grade in the same school. Her Kindergarten teacher would tell us that when she saw him in the hallway, her eyes lit up and she beamed a major smile. Almost like she spotted a movie star in the hallway. Yes! For her big bro! One of her favorite things to do is look at his elementary school yearbook; she always points out his pictures with a grin. At school, she can take out 2 books each week at library. Most weeks, she takes out books that my son has read (and owns!) merely because he’s already done so. More often than not, she only wants to play/do what he’s doing, which obviously isn’t always a thrill to him. I’ve found that they do have many of the same interests, including a common love for video games and computer games. If/when one makes an achievement they’ve been trying so hard for, who do you think is the first person they call for? Each other. Often you can find them playing together, hanging out and making each other laugh. Unless they are trying to fool me, it does appear that they enjoy one another’s company. Shh….don’t tell anyone, but I THINK they like each other. We have not quite reached those all-important, emotional, and terrifying teenage years – all I can hope is that they continue to love and support each other – even if it is all under the radar. Go ahead – drive each other loony, but always adore one another. Go ahead – bicker, but always wind up on the same team. Honesty they don’t even fight too often – if can keep their arguments as minor as disagreeing who sits next to whom in a restaurant or who wants what on their pizza, I think we can call this sibling thing a success. I realize that they are still young and their relationship is still developing, but from what I’ve observed so far, I’m going out on a limb to say “so far, so good.” And what an amazing view I have! And I hope that my husband and I can continue to encourage it. What little sister doesn’t want an older brother as her protector? My girl has that! And what older sibling doesn’t want a younger sibling to think he/she is the greatest thing since sliced bread? My boy has that! I’ll close with this message to them: I don’t think I realized how special the sibling relationship was until I had children of my own. As you get older, I hope you stay close. Life will take you in different directions, but I hope you are the best of friends forever and ever. Please take care of each other. Be there to support each other. Rely on each other as one of the few constants in your lives. Be more than siblings – BE EACH OTHER’S LIFELINES ALWAYS. You are the only 2 people in this whole wide world who are made up of the very same things on the inside. You, My Dears, ARE the best parts of me and your dad.